It is called many names; Connected Lookup, Cascading Dropdowns, Dependencies, etc. Whatever the nomenclature, the requirement to have one choice column drive the choices in a another choice drop down is an extremely common requirement in SharePoint applications. There is a Codeplex project that I discovered today, for WSS 3.0 and MOSS 2007. I've pretty much halted future development on MOSS 2007 at this point but I thought I'd post the link regardless. Codeplex (2010). 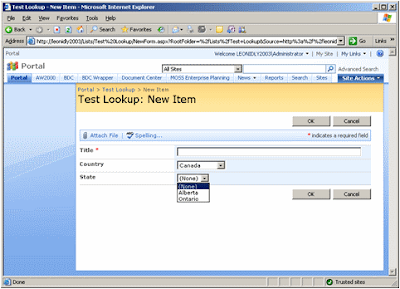 SharePoint Connected Lookup. Retrieved July 12, 2010 from http://cl.codeplex.com/. Thank you for publishing the good post.However I could not find the codeplex project for Moss 2007 from the site http://cl.codeplex.com/. Can you help me on this issues. Thanks a lot in advancce. Thank you for publishing the great post. How ever I could not find the codeplex project for MOSS 2007. Can you help me on this plz.